Milk Fever keeping you awake at night? 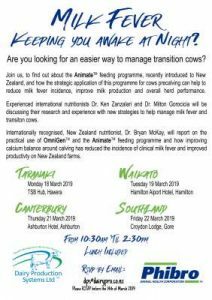 Join us, to find out about the feeding programme recently introduced to New Zealand, and how the strategic application of this programme for cows precalving can help to reduce milk fever incidence, improve milk production and overall herd performance. This entry was posted on March 13, 2019 by DPSL Office.